Why to spend so much and struggle for an ERP system? Syscon Cronus is India’s home grown, most comprehensive & affordable Enterprise Resource Planning (ERP) software. It is focused for Manufacturing and Large Trading Enterprises, for well over 2 decades. Now ready with GST version. Apart from standard Sales, Purchase, Inventory and Accounting, the Industries are looking for advanced features like Multi-location, CRM, Supply Chain Management (SCM), Services, Multi-level BOM (version control), Sub contracts (Job Work), Production Scheduling, Batch /Route-card, WIP, MRP, Process (consumption & rejections), Costing, QC, Maintenance & Payroll for Smart & Quick decision making. Last but not the least, Ready-to-use & Low cost ERP system with short implementation cycle & Long-term support. 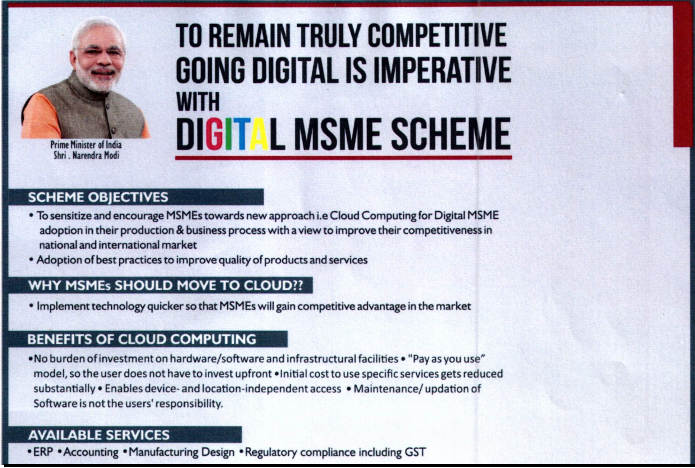 “Syscon Cronus is proud to be the #1 ERP vendor, under Digital MSME scheme”. A Golden opportunity for Indian MSMEs to embrace ERP. Why Syscon Cronus - ERP? Feature rich & GST Ready ERP solution with 14 days of free trial with support. On-line support with Data migration tools. Go-live within 2 weeks. ERP that fits your pockets & guarantees Return on Investment (ROI). We are inspired to create “Smart Digital Enterprises”. The Enterprise and Auditors can be part of a single real-time ERP system to achieve business growth and compliance. “We have been using Syscon Cronus ERP Software since 1998. We were one of their first set of Customers . Unlike ERP projects, they constantly provide us with updates. Thus the application has grown constantly on Technology and with added functional features. Syscon has prove to be a long-term player in the field of ERP”. Rich functionality, Reference Clients, Easy to Implement , Regular support, Low cost ERP without technology hassle, MIS at click of a button. We found Syscon Cronus ERP Software the right choice meeting all the above. I congratulate team Syscon for their ongoing support for the past 10 years and adding new features from time to time. We have been using Syscon Cronus since 2003. Syscon Cronus is an out-of-box & Low cost ERP Software, hence we could implement the same in short span of time. We are seeing visible, very positive change among our staff. Timely information is available through the application. We are using Syscon Cronus – ERP Software. It is excellent for the fast growing organization. It has made us to work in a systematic way and saved lot of time and money. We found that it is very low cost ERP, easy to implement, timely information, constant updates and supported by very good team. We thank Syscon team for their continued support.